News TV Channel / WDSU, virtual channel 6 (UHF digital channel 43), is an NBC-affiliated television station located in New Orleans, Louisiana, United States. The station is owned by the Hearst Television subsidiary of the Hearst Corporation. WDSU maintains studio facilities located on Howard Avenue in the New Orleans Central Business District, and its transmitter is located on Paris Road (Highway 47) in Chalmette. 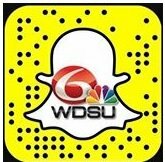 On cable, WDSU is carried on Cox Communications channel 7 in standard definition and digital channel 1007 in high definition.